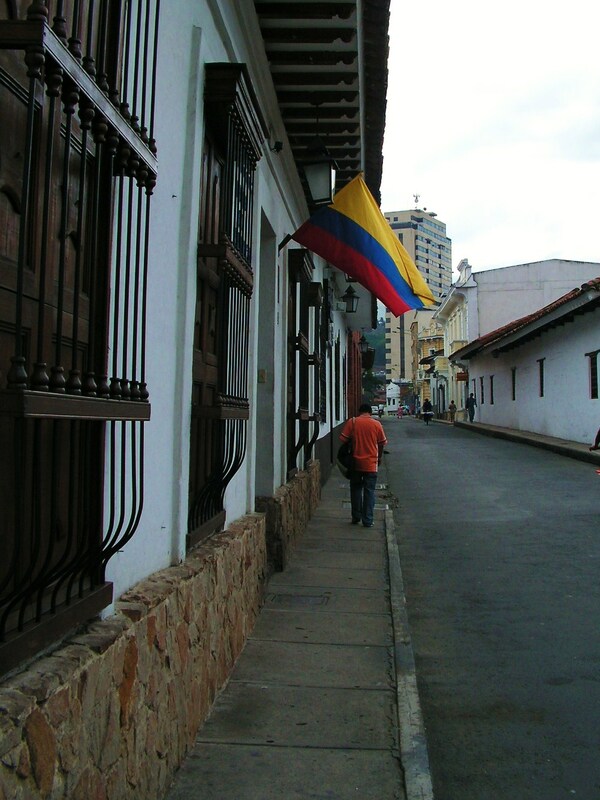 My Heart is STILL in Colombia! It’s true. We have been home from Cali, Colombia for 23 months with our little Colombian princess. The adoption journey has had bumps and twists that we didn’t expect, but it has been so wonderful and rewarding. Tomorrow is GOTCHA DAY number two! TWO YEARS!!! Hard to believe it has gone by so fast. Sometimes our month in Colombia seems like forever ago… and sometimes it seems like last week. I miss the lush greenness of Cali, the vast array of mystery fruits that were scrumptiously yummy, the glimpses of the Andes when the fog lifted, the bamboo forest we drove by to our villa, the coconut ice cream bars, the afternoon rain showers, the neighborhood boys who would come and ask, “Is Austin Rick’s son?”, the sweet smell of the flowers, arepas filled white cheese, the stickiness of the night air and the pee-po pee-po LOUD evening serenade of the coqui frogs. 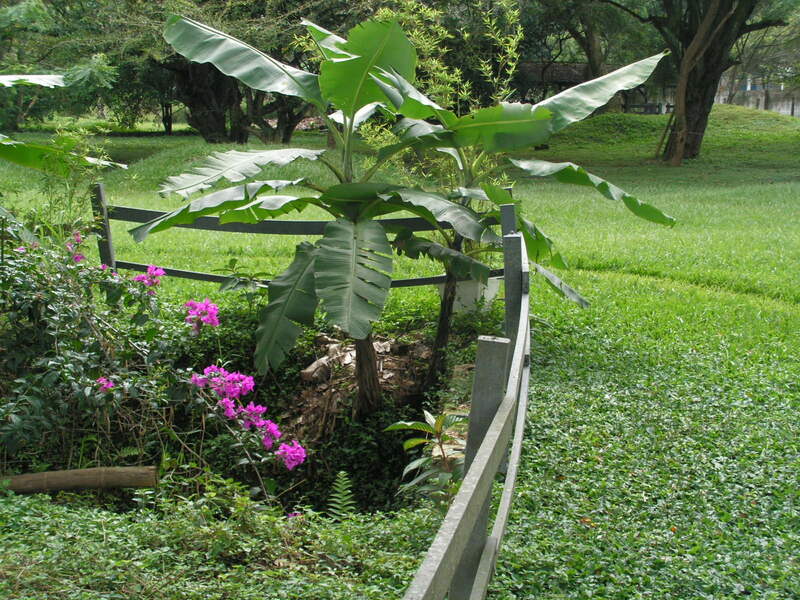 People often ask “Why Colombia?” Quite a few factors lead us to the beautiful and tropical South American country. 1.) 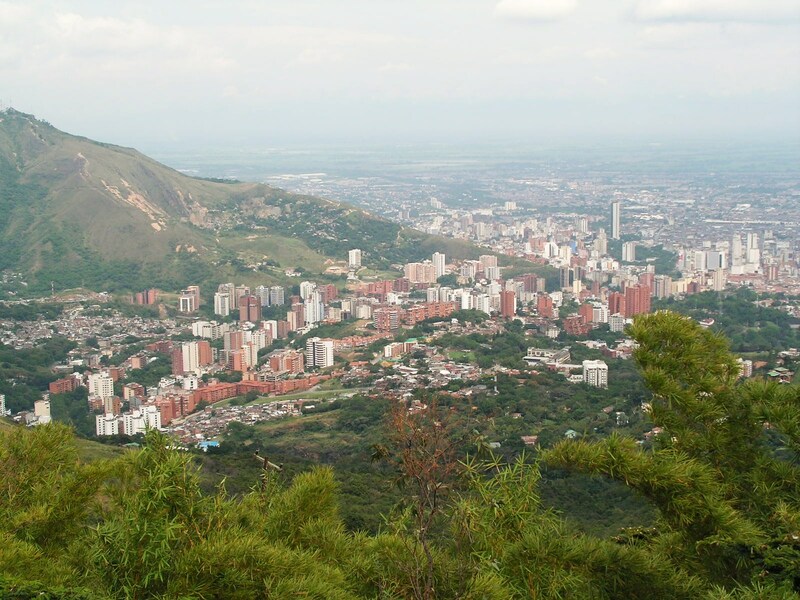 My husband, Rick, went to Valledupar, Colombia for a summer to build a church when he was 17-years-old. He grew to love the warm-hearted people and the countryside teeming with unknown vegetation, never imagining that he would return to meet his daughter twenty-something years later. 2.) We have three bio kids who do not look like Rick AT ALL. Ok, one does a little, but I was expecting little chubby, black-haired Indian babies when I married a Cree Indian. Didn’t happen. The Irish and Finnish genes dominated and we got two blonde-haired, blue-eyed kids and another slightly darker. So, when we had chosen an adoption agency, I looked through the pages for the countries they worked in…. I held up the two pages and announced to Rick, “El Salvador and Colombia are where the kids look like you.” “Colombia,” he replied. And it was a done deal. 3.) Not that I was anywhere near proficient, but I thoroughly enjoyed taking Spanish… back in the day. Larisa also had Spanish courses and was mastering her second language quite nicely. 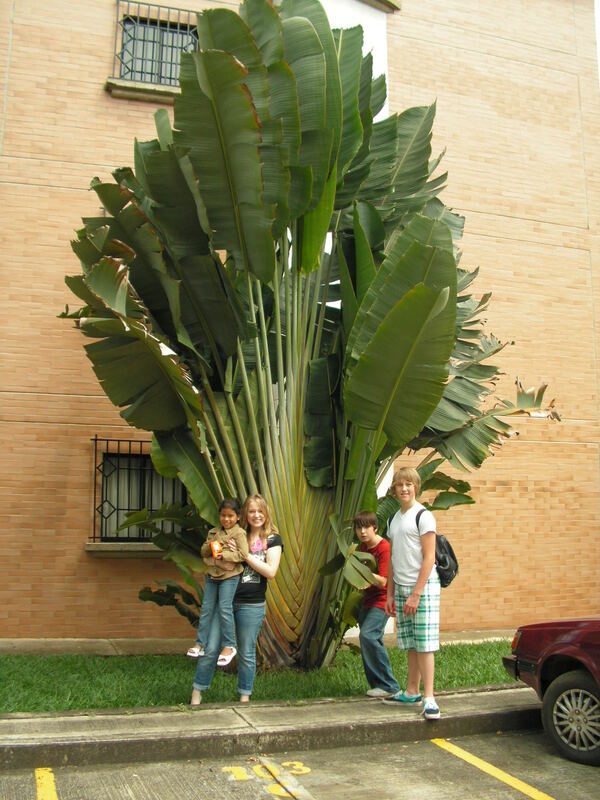 So a country in South America seemed familiar… somehow. (Not distant in my mind, like, say, Kazakhstan… or China.) I related to Ellie from the movie UP…. her dream was to visit South America. She tore pictures right out of a library book of the fascinating country. This day has new meaning for me. It is the day I figured out quite a few highly important tidbits about life. #3 My children are 75% Canadian and 25% American. #4 I’m out numbered in my own household when cheering for Olympic hockey games between the States and Canada. #5 A silver medal in the Olympics is awesome…. except in hockey. #6 Crosby is a sweet last name. See? Today was foundational for me. More next month. Please stay tuned. 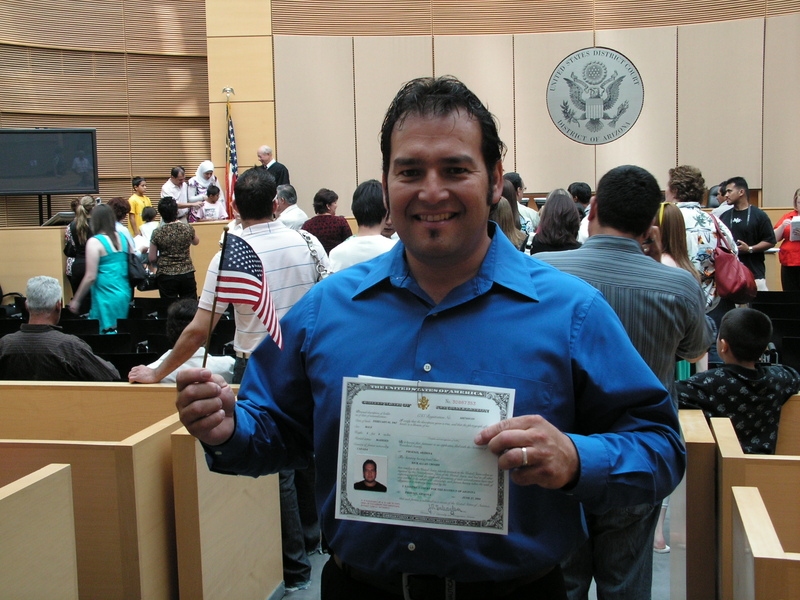 Today was Rick’s Naturalization ceremony and he is officially an American citizen. Wooo HOoo! A photo essay is certainly appropriate at this time. 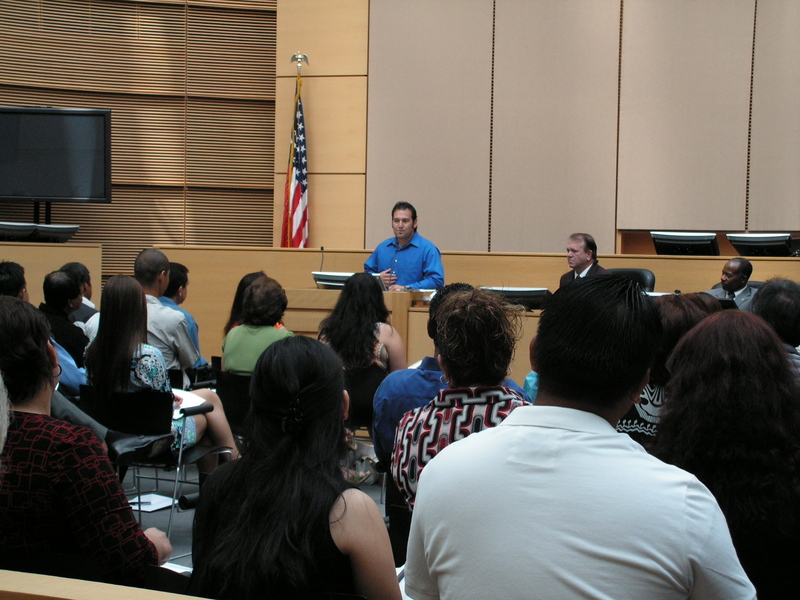 The judge gave three new citizens the opportunity to speak before the crowd in the circular courtroom. Of course, Rick jumped at the opportunity, being trained in hermeneutics and exegesis and aeronautics and all that. He was the best speaker, by far, no offense to the others who were speaking in their non-native tongue. Rick briefly mentioned that he married an American and we lived in Canada for 10 years. Then we moved here 11 years ago. He told about his job at ADOT flying the Secretary of State around Arizona to set up polling stations and ballot counting machines for elections…. elections in which he wasn’t allowed to vote. So right before the price increase, he decided to become an American so he could vote. (This comment got some good laughter from the crowd.) Then he encouraged all 91 other newbies to vote… as it is now their right, privilege and duty. He was sweet American eloquence in motion…. wrapped in Elvis-ish sideburns. 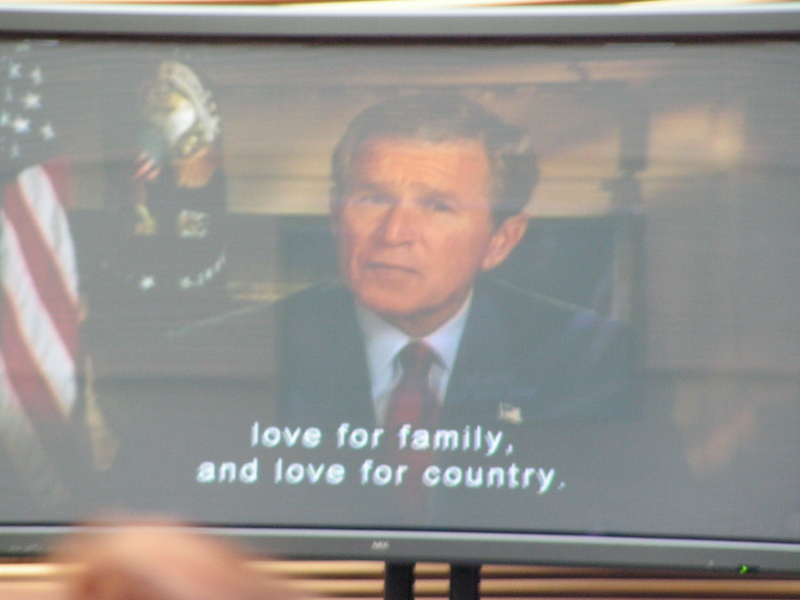 Then the President of the United States of America showed up (via DVD and some sweet big screens) and welcomed the newcomers to their home. 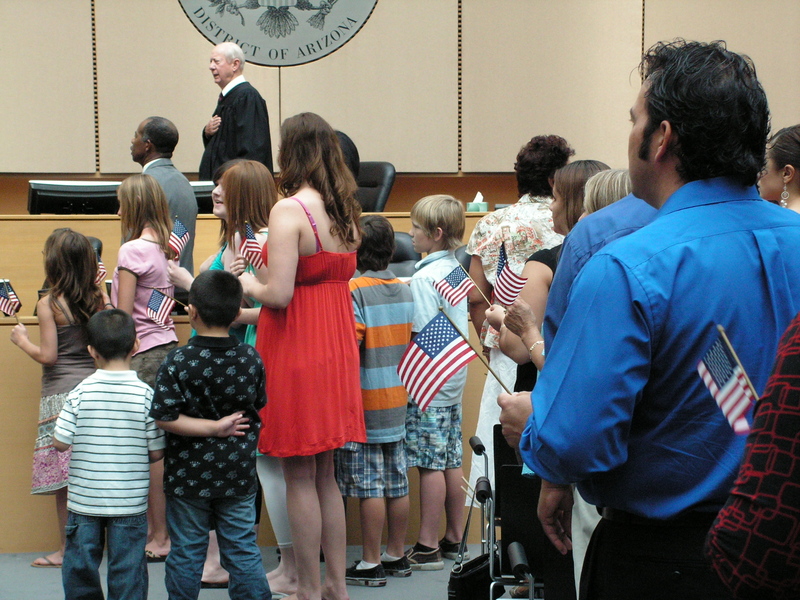 Next, ten children of the new Americans were called by name to the front to lead the Pledge of Allegiance. Keeve was pretty excited because his name was announced first. Aus and Keeve are the styling boys on the right in plaid and patchwork shorts….. note Elvis on the right. Larisa also went forward, but she is directly behind that tall gal in the red dress. 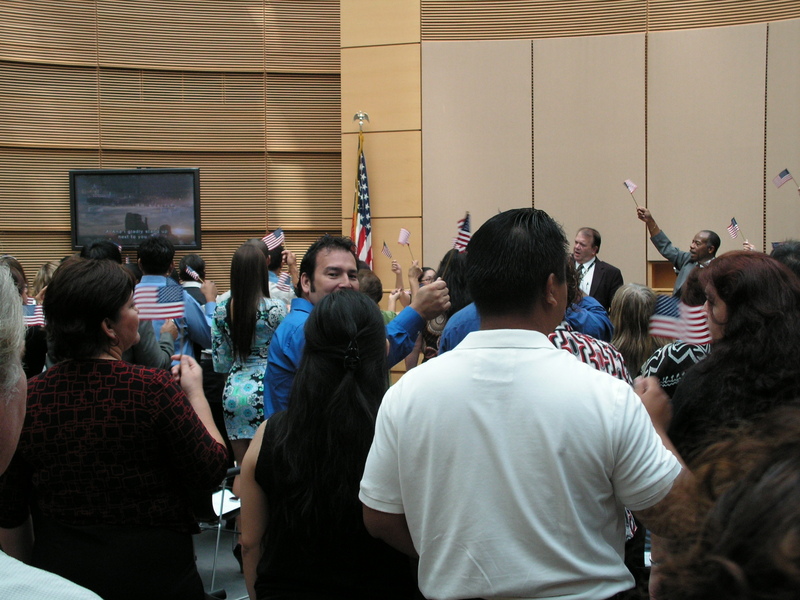 After the pledge, we all stood and waved little American flags and loudly sang “I’m Proud to be an American.” I must say, the fellows in the front, including the judge, waved their flags with vigor. The heartfelt song brought many tears to the courtroom. And then it was over…. 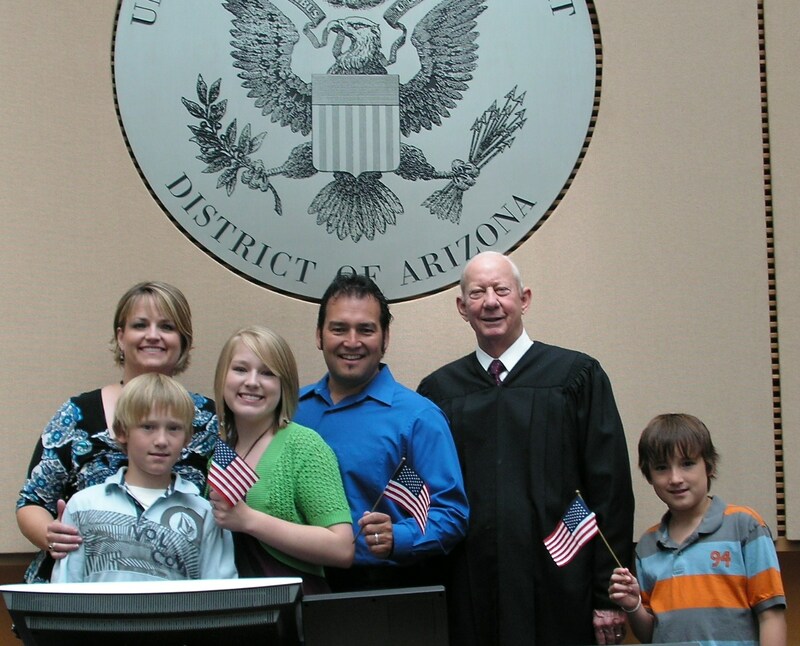 and there were FIVE Americans in the Crosby family in the District of Arizona. One, two, three, four, FIVE. Finally. Congratulations, Rick__ Allan Crosby. 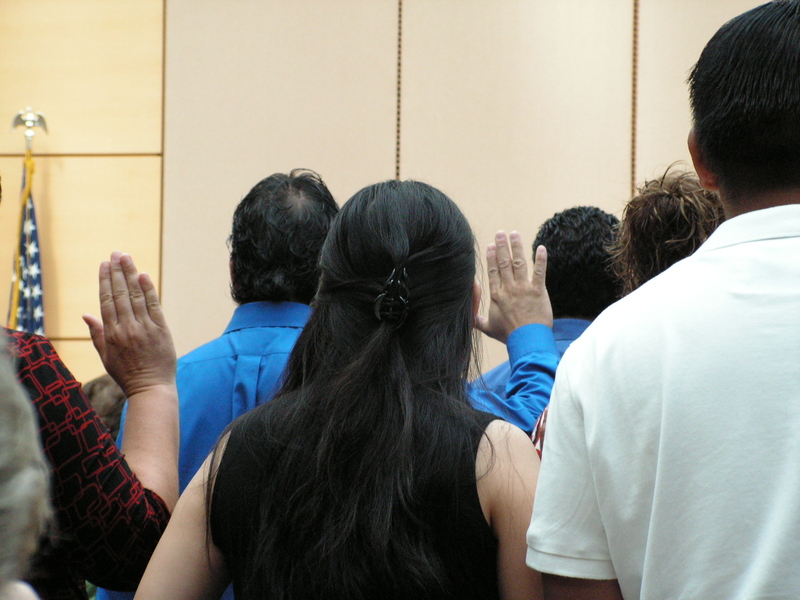 Did I mention that 75 of the 92 new citizens chose to change their names???? Just some interesting trivia. Veeeerrrrry interesting. Please stayed tuned for tomorrow’s blog where photographic evidence will be revealed showing the American graffiti and damage done to our home and land whilst we were doing our civic duty.